Together with London based surface design studio Métier, we bring you an exciting collection of printed plywood furniture. Combining our playful designs with Métier's modern printing and traditional crafting techniques we have produced a capsule collection of 3 customisable pieces- Coffee, Console and Side table options are available printed with a choice of 3 of Flock's signature prints- Northmore, Aldgate East and Cracked Ice, with either white, grey or brilliant orange powder coated steel hair pin legs. 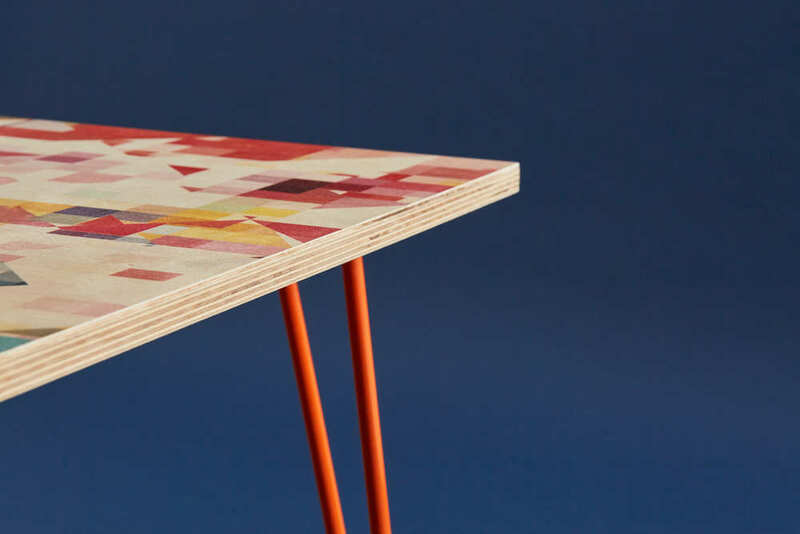 Swapping textiles for timber to see how the Flock patterns transform and adapt has been fascinating, each table is unique and is digitally printed using advance UV ink technology onto birch ply. The results are truly beautiful, precise and hand crafted. Through the print the intricacies and texture of the wood grain is captured. Beautifully powder coated steel hairpin legs give a vivid, dense and highly polished finish, a perfect harmony between contemporary and traditional.